Dallas Cowboys Cheerleaders: Making the Team is now airing on CMT, and its first episode of season 12 debuted on August 3! Below is a behind-the-scenes take from veteran DCC judge (and exclusive Dallas Cowboys game day sideline reporter and all-around Cowboys expert) Kristi Scales, and her point of view of the extensive Dallas Cowboys Cheerleader Audition process. Follow us for more of Kristi&apos;s unique take on this year&apos;s talent and the fun stuff they get into all season! Tune in every Thursday on CMT to catch the newest episode of DCCMTT 10 p.m. ET/PT! Round 1 of 2017 Dallas Cowboys Cheerleaders Auditions was Saturday, May 6th. Several hundred hopefuls flocked to Arlington’s AT&T Stadium in pursuit of their dream of joining America’s Sweethearts. For those contestants that made it past the judges in Round 1’s “Freestyle Dance”, the next day was Semifinals/Round 2 which included learning choreography for a DCC-style jazz combo and the world famous DCC Kick Line. The following weekend, May 13th, was Round 3/Finals. 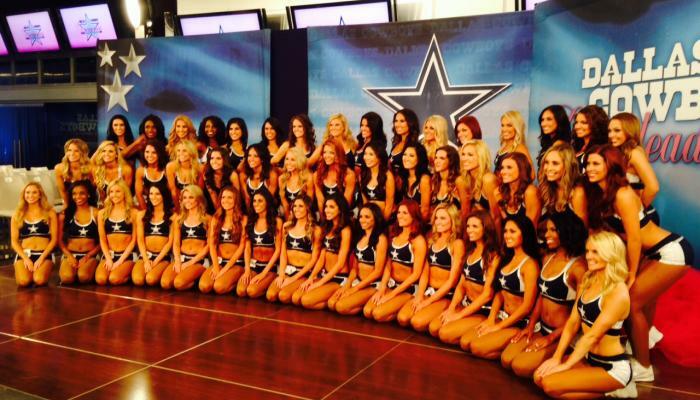 That’s where it got really interesting, because the rookie hopefuls were side-by-side with returning DCC veterans. A morning session in which hopefuls/veterans performed solo routines (choosing their own choreography, costume, music/song) was followed by an afternoon session on the football field. The on-field session was the choreographed jazz combo and kick line. But how exactly are the contestants – newcomers or returning veterans – judged? What are the criteria? Now entering my 17th year as a judge, I can tell you that music and costumes may change, but the criteria remain constant. On our judge’s score sheet, there are six columns. We make notes within each column for each of the contestants. Each criterion is equally important. Some deal with dance, others with physical appearance. Others have to do with the contestants’ ability to learn multiple dance routines in a short amount of time. In other words, a DCC has to have the whole package: dance, looks and brains. “Beauty”: do you think she’s attractive/pretty? “Showmanship”: this is about a contestant’s dance ability/style. Is she fun to watch? Does she catch your eye? Can she be a world-class performer? “Ability to Learn”: can she handle the choreography during Rounds 2 & 3, or does she get totally lost? It doesn’t have to be perfect, but if you get too lost in learning just one routine during auditions, it’s unlikely you can learn multiple routines during each evening of rehearsals in DCC Summer Training Camp. “Kicks”: how high are her ‘high kicks’ during the DCC kick line? Is she flexible enough to improve those kicks? Most of the contestants are from dance/cheer backgrounds, not drill team. So kicks are not easy for all the hopefuls. Bottom line: if you can’t kick, you can’t be on the DCC. The kick line is a mainstay of every game-day performance. “Splits”: at the end of each Kick Line in Rounds 2 & 3, contestants must do a right split as well as a left split. This is not the Jump Split that Cowboys fans see at the end of each Kick Line on game day (contestants learn the jump split during DCC Summer Training Camp). During auditions, you are asked to do splits so that judges can see if you have enough flexibility to properly execute the Kick Line and Jump Split during camp. As judges, we make notes under each column. But that’s NOT THE FINAL WORD. If a contestant receives enough “YES” and/or “MAYBE” votes, she advances to the next round. Each contestant receives full consideration. The judges literally sit around a conference table and discuss each contestant. The DCC director, Kelli Finglass, leads the discussion, and then calls for a vote. As judges, we literally raise our hands to vote “yes” or “maybe” or “no”. There are approximately 10-to-12 judges, so there are multiple opinions. Each judge has a different background, so different dance styles and physical appearances/physiques appeal to different judges. Approximately 110-to-125 contestants emerged from Round 1. They competed against each other in Round 2 the following day. By Sunday evening, about 55-70 were invited back for Round 3/Finals on Saturday, May 13th. There will be about 25-30 returning veterans. By the end of Round 3, approximately 42-45 DCC hopefuls will pass the judge’s scrutiny. They will be invited to DCC Summer Training Camp which begins in early June. They will rehearse each week night. By early August, the final squad of 36 will be selected.